In 2008 Chef Kerry Simon packed up his knives at the Hard Rock Casino and Hotel and moved across the Las Vegas Strip into the Palms Place tower at the Palms. The new restaurant features some of the same comfort food favorites as the old joint, such as truffled & cheese and cotton candy for dessert, but Kerry has now added a sushi bar and a broader menu which includes breakfast, lunch and a must-try Sunday brunch where you may be eating alongside the likes of Avril Lavigne or Hugh Hefner and his girlfriends. 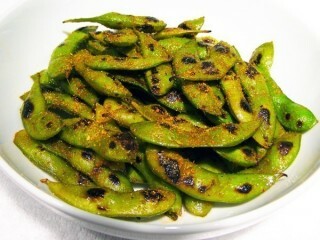 When you're noodling over which appetizers to try you must check out this delicious addicting edamame starter: A pile of soybeans are cooked over high heat in a wok until their pods are blackened in spots, then they're tossed in fresh lime juice and a Japanese 7-spice seasoning called shichimi togarashi. Togarashi is a spicy blend of orange peel, sesame seeds, seaweed and chili that you can purchase in most Asian markets or online. The blend usually doesn't include salt, so you'll have to add some of that as well before you dig in. Or, you can use Szechwan seasoning such as one made by Sun-Bird that's found in most grocery stores where the Asian foods are parked. These blends will usually have salt in them, so you probably don't need to add additional salt if you use the Szechwan seasoning. You'll want to cook these in a wok that's been preheated over a flame on a gas stove, or you can use a cast-iron skillet that's been preheated for at least 10 minutes - you should see a lot of smoke when you drop those beans in the pan! Turn on the vent over your stove before you start cooking unless you need to test your smoke detectors.